It is indeed not a correct approach to take a simplistic view of the state-citizenship relationship as one depending on mutual obligations. However, in today’s modern societies, governments are expected to act in full awareness of their obligations towards citizens and serve their needs accordingly. Institutions providing public services have citizens as their customers and there can be no talk of an indifferent public administration in democratic societies. Therefore, public administrators should focus all their attention on the citizens they serve, just as in private corporations. There are lots of good examples of public institutions doing exactly this. One of these is the Municipality of Zeytinburnu whose sole purpose is to manage citizen complaints using corporate solutions. We have established a ‘resolution center’ at our municipality to help resolve customer complaints. The resolution center collects all citizen complaints indiscriminately without evaluating their authenticity and goes over them one by one. 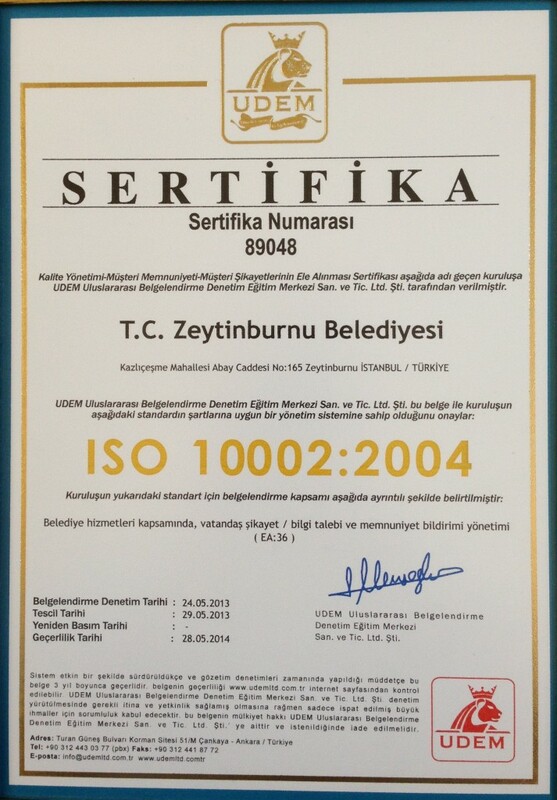 @ Each complaint is handled, processed and finalized according to predefined processes in line with ISO 10002 standards. @ Our primary goal is to analyze each incoming complaint and find out their root causes in order to create higher service standards. We are not just trying to resolve the complaint; we also strive to generate systematic solutions based on our root-cause analyses and thus provide better service to citizens. @ We make progress using a ‘Citizen Satisfaction Handling Process Chart’ while working on a case at the resolution center. We do not need any additional technical support thanks to Mi4biz creating and updating the chart. Having instant access to all sorts of data of all sizes from the bottom to the very top with regards to the implementation of amendments to the workflow is the most critical aspect of complaint management. @ Another critical aspect is getting feedback from customers at regular intervals via surveys to measure their level of satisfaction with the services rendered. The fact that the platform that we currently use gives us access to survey data so that they can be objectively assessed is another crucial point. In a recent survey, citizens have mentioned that they were 95.5% pleased with our method of resolve complaint methodology. @ The most prominent aspect of ensuring greater citizens satisfaction is punctuality. Punctual and effective resolution of complaints and the smooth running of services are the greatest determiners of citizen satisfaction. According to another recent survey, the timely resolution rate of customer complaints currently lies at 89%. @ We can monitor all customer communications in their entirety using Mi4biz. We watch the life cycle of a communication from end to end. This way we can instantaneously monitor who performed what actions at what stages and how long it took them to do so. @ Classifying citizen communications according to predefined categories and prioritizing them is another aspect of this business that we pay great attention to. A neatly categorized communication is automatically escalated to a pre-designed flow before behind handled without any need for any additional knowledge or expertise. The Municipality of Zeytinburnu took a giant step forward in ensuring sustainable customer satisfaction by integrating Mi4biz into its customer complaint management practices. The municipality stands out in the surveys as the most committed public service provider for sustainable customer satisfaction. Mi4biz allows consumers to make their voices heard by service providers so that their gripes and grievances can be resolved in the best possible manner.